I’ve been teaching about memorials for over a decade. My goal has always been to help students understand the historical nuance of memorials: what they meant when they were constructed, the political processes that shaped them, the ways that their meanings changed over time. 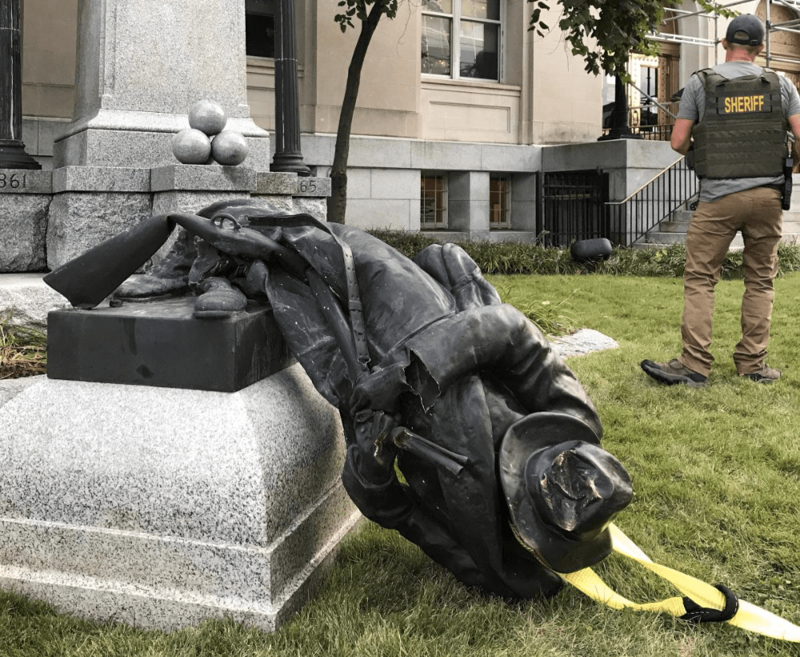 But I must admit: the video of the Durham confederate memorial being toppled gave me a visceral thrill. The confident way Takiyah Thompson climbed the ladder and fastened a rigger’s sling around the statue. Her hand signals to the crew on the ground: tighten up! That satisfying crunch when it hit the ground, the cheapness of its manufacture revealed. Meaning-making in action! The academic response to public concern over Confederate memorials has been: put them in a museum. In general, I like this idea. We need more exhibitions on the Jim Crow era, and some Confederate memorials should be there, along with KKK robes and the other objects that helped roll back the advances of Reconstruction and enforced white supremacy in the twentieth century. But this statue would make its point better lying crumpled on the ground where it fell—say, for the next century or so, for about as long as it stood on its plinth. It makes for an exhibition on its own. The symmetries of its construction and demolition are striking. It was created as a political act, to show the strength of white supremacists. Its destruction was no more political, striking a blow against the white supremacy it represented. It was as much a work of art for its time as the action of its destruction is a work of art for our time. The Berlin Wall offers a good model. It too was demolished in the name of freedom. Bits of it remain, gouged by picks and covered with graffiti, serving as a memorial both to those who suffered from the system it represented and to those who demolished it. It is important to remember oppressive regimes, but also to celebrate their passing.